Wireless bodypacks have been getting smaller and tougher in recent years, in response to broadcast sports’ increased use of wireless sound from the field and on athletes. With mics now routinely buried in the dirt around home plate and the pitcher’s mound, as well as on NFL linemen repeatedly bringing thousands of PSI to bear on scrimmage lines, these transmitters have had to shrink in size even as they had to increase in functionality and endurance. And they have to do so without increasing the possibility of harm to the players they’re monitoring. Now broadcast sports is also asking those same miniature marvels to get smarter, too. Wireless bodypacks are now expected to be able to be remotely controlled, manage their own power supplies, navigate a radically transformed RF-spectrum landscape, and, when necessary, also operate in spy mode. Lectrosonics VP, Sales, Karl Winkler says that, while the usual requirements around miniaturization, comfort, and robustness still apply, he’s seeing more requests for encryption capability in wireless audio systems for sports: for instance, for the wireless systems that Lectrosonics supplies for coaches’ call on ESPN’s NBA broadcasts. That kind of audio can be guarded by using delays and airing it only on replays, but, says Winkler, leagues and teams are increasingly concerned about the potential for its being intercepted by anyone wirelessly scanning for it, either for amusement or for more nefarious purposes, using anything from sophisticated scanners to iPhones with specialized apps. Zaxcom’s bodypack transmitters have incorporated encryption since they were first marketed and have reportedly been used by the NFL for that reason. The company’s new ZMT Flex wireless transmitter, which debuted at the SVG Summit in December, is aimed at expanding the availability of encryption as more sports teams and leagues become aware of how “leaked” audio — whether it be game strategy or an athlete’s personal peccadillos — can cause problems. Zaxcom’s Glenn Sanders expects demand for encoded RF transmissions to extend to more sports in the near future. “We’ve been doing encryption for forever; it’s the sports industry that’s changed,” says Zaxcom President Glenn Sanders, adding that he expects demand for encoded RF transmissions to extend to more types of sports in the near future. 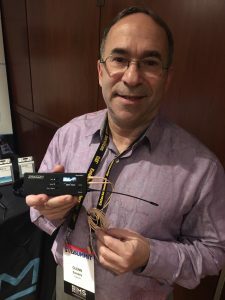 He also points to Zaxcom’s unique ability to have its transmitters record audio as they transmit it, which he says plays into the Mic’ed Up phenomenon: the growing demand for more up-close and on-field sound. Remote control of operational parameters is making transmitters smarter, according to Paul Johnson, CEO, Quantum5X, which makes the PlayerMic and more recently the RefMicHD for NHL applications. For example, output power level and frequency selections on those bodypacks can be adjusted remotely. What might make them smarter still is AI, which will enable wireless transmitters to address certain parameters on their own. Shure’s Axient digital wireless system already does this to an extent, allowing either the unit to adjust frequencies when necessary or the user to manually override. In an industry that often makes a game out of “opposition research,” security is going to become even more critical for sports RF users in the near future. It’s one more important responsibility that will fall to the ever-smaller, ever-smarter wireless bodypack.